It’s time to make your wound consulting business a reality. Here’s what you need to know. So, you’ve been thinking about starting that wound care business you’ve always dreamed about. What’s next? 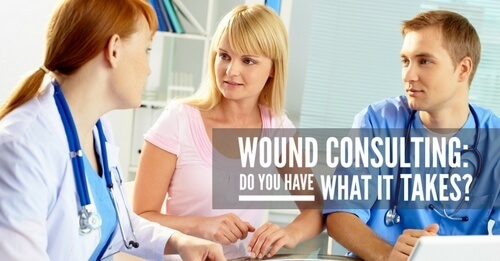 First, start by taking a look at Wound Consulting Business: Do You Have What It Takes?, to see what factors you should consider before taking the plunge. It’ll help you decide if you’re cut out to be your own boss. Then, if you still think being a wound consultant is for you, let’s talk about getting started. Wound Consulting Business: Do You Have What It Takes? Thinking about starting your own wound care business or becoming a wound consultant? Here’s what you need to know. Being a wound consultant is a dream for so many clinicians. It can be exciting and rewarding to start a wound care business, but it can also be overwhelming, confusing and risky. So before you take the plunge, here are some serious questions and factors to consider. Posted in Wound Care | Comments Off on Wound Consulting Business: Do You Have What It Takes?